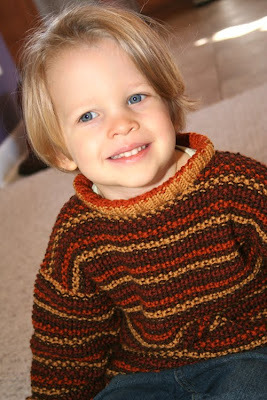 Finn's ubiquitous birthday sweater came off the needles just in time. Not in time for his birthday exactly since the pattern didn't call for enough of the the main color yarn and I had to order another skein (which was backordered). 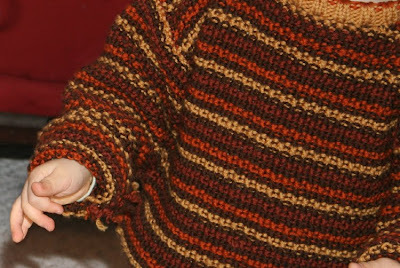 When it finally appeared in my mailbox, 3 days before Finn's birthday, Christmas celebrating had commenced so there wasn't a chance to finish the sweater until this week. Fortunately, we celebrated Finn's birthday (and his cousin, Aren, whose birthday falls on Christmas Eve) with family today so he was able to wear his birthday sweater for his party. I have to say that I'm pretty pleased overall with how the sweater turned out, especially since this was my first sweater, and I, for some reason, thought it would be a good idea to start with stripes. Isn't he so sweet?! I could eat him for lunch! The minor detail that I wasn't crazy about was the fact that the sleeves turned out longer than the body of the sweater. 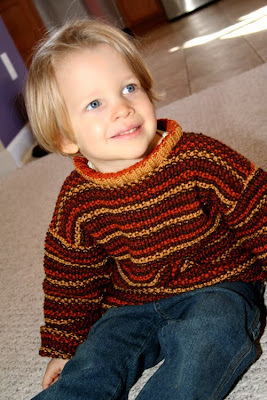 I used the size 4-5 pattern, which was spot on for the sleeves, but the body was more like a size 3 so I doubt this sweater will fit him past the fall. 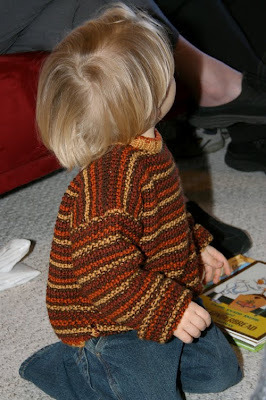 If I knit this sweater again, I'll add another 1.5-2 inches to the length of the front and back. I've also started working on a birthday sweater for Elizabeth (due in 1 month) by the same company so I'm more conscious of the length this time. Onward and upward to more sweater knitting. Now that I've delved into this world, I'm anxious to try different patterns and yarns. I'll keep you posted as Elizabeth's birthday sweater becomes fleshed out and as I start on one for a wee cousin due in the spring. It sure turned out beautiful, long sleeves or not. :) You have quite the talent! It looks perfect on him!! Watch out! Sweaters are addicting!! looks gorgeous! he is such a sweetie. Happy birthday Finn!! Finn looks like such a big boy! And that sweater is fabulous, I can't believe it's your first! Nice work! Joy, that is quite a feat! I'm really impressed-- tell Finn not to grow this year so he can wear it longer. that sweater is absolutely AMAZING!!! !